After starting 2019 with yet another goal against a Top 6 squad in the FA Cup, we tell how Raul Jimenez is taking English football by storm. That poor run Raul Jimenez made against Raphael Varane when he first came to Europe with Atletico Madrid is old news, the Mexican striker has come a long way in English football as a Wolverhampton Wanderers player on his very first season. When he first arrived in the club that manages Nuno Espirito Santo, not even the media from his own country believed he could make a real impact on the squad and they gave him only a few months to survive the difficulties of the Premier League. It was true, Raul Jimenez didn’t have the pace for this competition, he lacked the physical prowess and he needed to work a massive amount of hours in order to reach a certain level that could help him shine in the isles. To the surprise of absolutely everybody, Raul Jimenez is considered one of the Wolves’ most important players by the half of the season in the Premier League. Nuno’s squad is widely considered as the underdogs of the tournament, every single Top 6 squad that will face them at the Molineux Stadium is afraid of what might happen. Raul Jimenez is a very big part of this fear, as the Mexican striker has transformed into life insurance for his squad. Just during the first half of the season alone, Jimenez has already managed to leave an impression that has been good enough for Wolverhampton to have 29 points in the Premier League and not even worry about relegation this season. On the contrary, Nuno’s squad is actually dreaming of possibly reaching the positions that could even give them a chance to play European competitions next season thanks to Raul Jimenez’s goals. During the first semester of the tournament, Raul has already scored 6 Premier League goals. But the most impressive part of this stat is that half of those goals have been scored against two of the most powerful clubs in the country. The striker first scored against Chelsea, then he scored two against Tottenham in December to close the year in spectacular fashion. The other three goals came against Everton, Burnley, and AFC Bournemouth. In the assist department, Raul Jimenez has already provided his teammates with five Premier League assists throughout all the 19 matches that Wolverhampton had played this season until this Monday. But Raul seems determined to leave an indelible mark in English football during 2019. The hype for this Monday’s FA Cup match between Wolverhampton and Liverpool was in an all-time high, the Reds were coming to this match as the most unplayable squad in the country and Nuno’s squad as the Dark Horse in English football. We all were expecting a fantastic match from both sides, one in which Raul Jimenez left his mark once again in spectacular fashion. 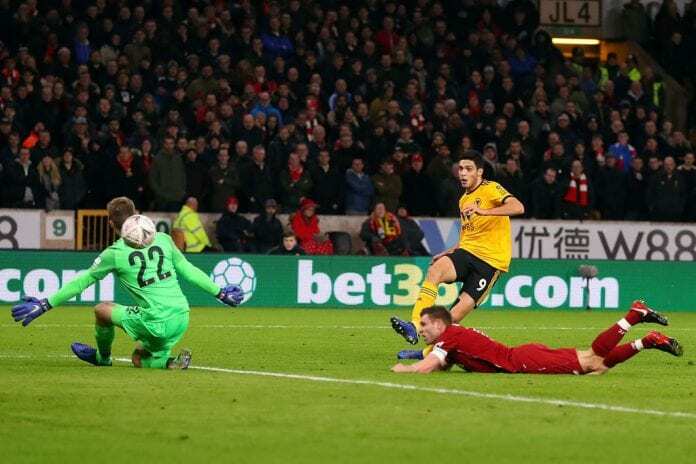 Molineux Stadium was the stage for a match in which the winner would advance to the next round, Jürgen Klopp decided to rest many of his best players and he didn’t realize what a mistake he made because the Wolves were ready to compete with their best squad. Nuno Espirito Santo feels like his squad can do great things in the competition this season, he wasn’t going to let this opportunity pass him by. With a fantastic counter-attack run during the 38th minute of the match, Raul Jimenez scored the first goal of the evening against Liverpool and helped his squad knock Liverpool out of the competition after a 2-1 victory after Origi equalized during the second half and Neves scored the winner. We don’t need any more proof about Jimenez, this player has something very special and he came to English football to stay. What do you think about Raul Jimenez’s level of performance so far this season with Wolverhampton? Please share your opinion in the comment section down below.